First it was my former election opponent and ALP stalwart the Member for Reid who named me in Federal Parliament. Mr Ferguson expressed some surprise at my criticisms of certain Howard Government policies. Then my former colleague in the Conservative wing of the NSW Liberals, the member for Mackellar, decided to accuse me of being a “Muslim activist” who was known for his abusive attitude toward women. I’m not sure if Mrs Bishop’s claims about my attitude toward women led to my being selected as an official Ambassador for the Australian White Ribbon Day campaign to promote the UN’s designated International Day for the Elimination of Violence Against Women. 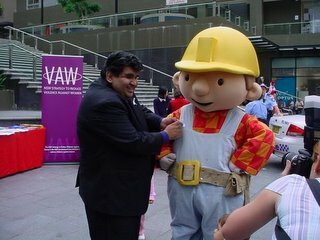 Although I am pleased to say my efforts seem to have convinced at least one prominent figure in the construction industry to improve his attitude toward women. Now it seems that the Member for Melbourne Ports has decided to ask a question. Mr Danby was a former member of the Australia/Israel Publications, an unincorporated entity which has already mentioned my name in vain in a number of their publications. Since that time, I am informed the successor to the AIP and Mr Danby appear to have parted ways. This, however, does not stop Mr Danby from publishing the odd attack on anyone deemed to be saying something even mildly critical of a certain non-Arab state in the Middle East whose name is not Iran. Indeed, I am not sure if Mr Danby has actually ever asked a question pertaining to the people of his electorate. Admittedly, I haven’t checked Hansard of late. But it seems Mr Danby’s concern is less about contentious industrial policies or welfare reforms and more about protecting the reputation of a certain foreign country. Of course, I have no problems with Mr Danby doing this. I mean, I don’t live in his electorate. Although if my local member spent so much time harping on about a foreign power (even if it be my parents’ ancestral homes in the Indian sub-Continent), I would be a tad concerned. On this occasion, Mr Danby chose to focus on a local issue, and I must say his question was fair enough. Mr Danby’s questions to Mr Ruddock concerned some comments I had made some months back about an anti-Semitic text being distributed at a camp organised by the Australian Federation of Islamic Councils (AFIC) in 1985/86. Mr Danby, of course, decided to make my comments much broader, almost seeking to cast aspersions that all Muslim organisations (including presumably Cypriot Muslim groups in his electorate) are openly distributing anti-Semitic literature to young Muslim Australians. To his credit, Attorney-General Phillip Ruddock addressed the issues with precision and balance. He noted that the claims I made concerned activities back in 1985, back in the days when it was OK to claim all Palestinians were a bunch of Jew-hating Nazis who hijacked planes. In case anyone feels my description of the discussions between Messrs Danby and Ruddock is somewhat unfair, I reproduce the relevant section of Hansard which was provided to me by a kind journalist from the Canberra Press Gallery. (1) Has he seen allegations by Mr Irfan Yusuf, a former Liberal Party federal election candidate, that Islamic organisations are distributing the notorious anti-Semitic forgery, The Protocols of the Learned Elders of Zion, to Islamic youth in Sydney. (2) Has he seen further allegations by Mr Yusuf that copies of the Protocols are being supplied to Islamic organisations by the Embassy of Saudi Arabia. (3) What steps is he taking to ascertain the truth of these allegations and what steps will he take to prevent the importation or circulation of material such as the Protocols which is fraudulent, defamatory, inflammatory and designed to foment racial and religious hatred. (1) Yes. I am aware of Mr Yusuf's statements to media outlets. Although I note the allegations by Mr Yusuf relate to an incident in 1985 in which he claims that he and other attendees at an Islamic camp organised by the Australian Federation of Islamic Councils were provided with copies of The Protocols of the Learned Elders of Zion. (2) Yes. I have seen a statement made by Mr Yusuf to Radio National on 28 August 2005 that he received a copy of the book The Protocols of the Learned Elders of Zion. I am aware Mr Yusuf further alleged the book had a stamp of the Australian Federation of Islamic Councils on the inside cover and that the book was a gift from the Saudi Embassy. I note this allegation also relates to activities in 1985. (3) The Australian Federal Police has not received any complaints or allegations regarding The Protocols of the Learned Elders of Zion since 1997. A strong criminal legislative framework already exists at a federal level. Mr Danby would be aware that the Australian Government is introducing a range of measures to improve the national security framework, including a new offence against inciting violence. Inciting a person to commit any criminal offence is an offence in its own right under section 11.4 of the Criminal Code Act 1995. In order to address situation in which statements aimed at the naïve and impressionable may incite criminal activity or terrorist acts, the Government has modernised the offence of sedition in sections 24A to 24F of the Crimes Act. These offences cover a person who engages in a 'seditious enterprise' with the intention of causing violence or creating public disorder or a public disturbance, or who writes, prints, utters or publishes any seditious words with the intention of causing violence or creating public disorder or a public disturbance. The new offence will address problems with those who incite directly against other groups within our community, including against Australia's forces overseas and in support of Australia's enemies. There is a good faith defence where the communication is merely about criticising government policy. In addition, ASIO has said publicly that it works closely with police services in relation to threats to Israeli and Jewish interest and maintains regular contact with representatives of the Jewish community. ASIO also maintains regular contact with the Muslim community leaders and works closely with police services in connection with threats to the Muslim community. Mr Danby would also be aware that the Australian Government is introducing a range of measures to improve the national security framework, including a new offence against inciting violence. Possible alternative measures available to deal with this material include prohibition as racial vilification under the Racial Discrimination Act 1975, or the involvement of the Australian Federal Police where criminal conduct is alleged. An application for classification of a publication may be made for Law enforcement purposes, under section 22A of the Classification (Publications, Films and Computer Games) Act 1995. I am advised that no application for classification has been made for this publication. Accordingly, no comment can be made on the appropriate classification of this book. If it were to be submitted, its classification would be a matter for the Classification Board. The Commonwealth Racial Discrimination Act 1975 prohibits racial vilification on the basis of race, colour, or national or ethnic origin ('offensive behaviour based on racial hatred'). Racial vilification covers acts that offend, insult, humiliate or intimidate a person or groups of people. The prohibition is subject to a number of exemptions which are intended to ensure that debate can occur freely in respect of matters of legitimate public interest. Complaints of racial vilification may be made to the Human Rights and Equal Opportunity Commission. The Racial Discrimination Act 1975 does not cover criminal conduct. Any allegations of criminal conduct should be referred to the Australian Federal Police. Most importantly, it must be remembered that the rights to freedom of expression, association and assembly are fundamental human rights that are enjoyed by all Australians. These rights are subject to limitations that are reasonable and necessary in a free and democratic society to achieve an appropriate balance between freedom of expression and the protection of groups and individuals from offensive behaviour.